Fuchsia fulgens Moc. & Sesse ex DC. 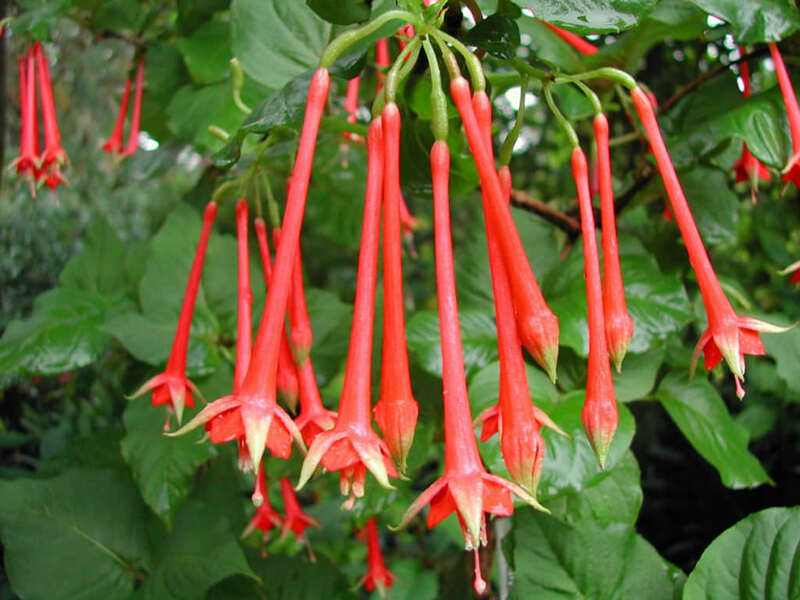 Fuchsia fulgens is an erect, deciduous shrub up to 5 feet (1.5 m) tall, with large, broadly ovate leaves and pendent terminal racemes of flowers. 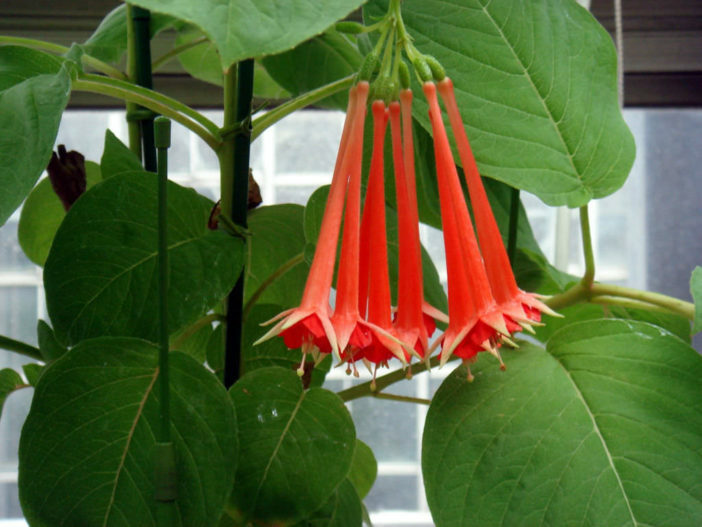 They are up to 2 inches (5 cm) long with slender pale red tubes, green sepals and small red petals. The fruit is oblong to ellipsoid in shape and deep purple in color. 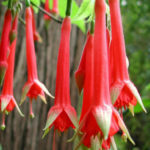 Fuchsia make excellent houseplants, in part because they are well adapted to growing in shadier conditions. 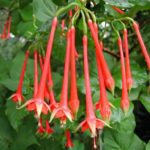 In general, the more heat and light a Fuchsia is subjected to, the more careful you’ll have to be about watering. In some cases, you might be watering every day. To prevent fungal problems and pests, be careful not to let your Fuchsia leaves touch the dirt. Even then, whiteflies can be a problem for Fuchsia and should be treated at the first sign of an infestation (look for white webs on the undersides of leaves). When treating for whitefly, make sure to spray the undersides of leaves thoroughly to disrupt their life cycle. 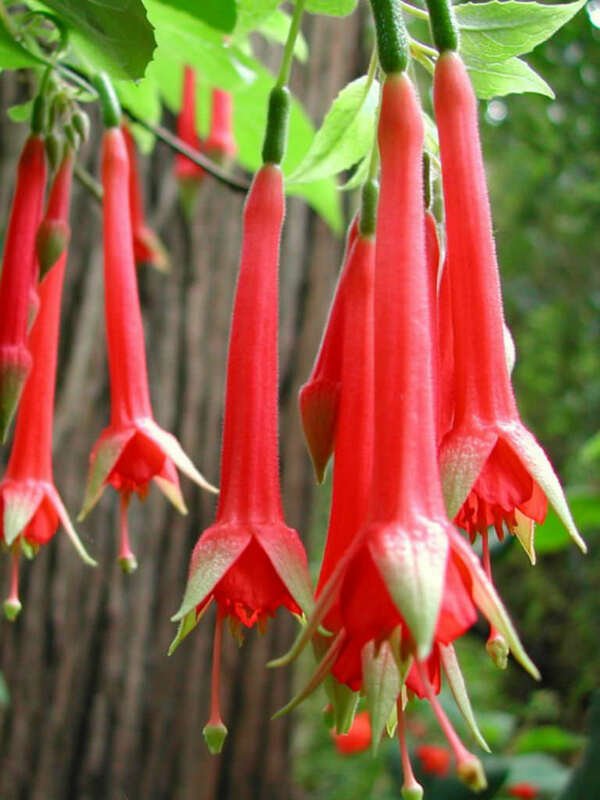 To overwinter your Fuchsia, let the leaves drop off in spring, reduce watering, and move it to a cool and dark room. New growth should appear in the spring. 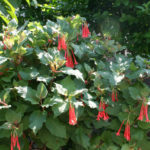 Repot your Fuchsia in the spring annually. These plants require a rich supply of organic material to flower and perform their best, so even if you’re not stepping the plant up to a larger pot, you should repot it into a fresh pot with new soil. 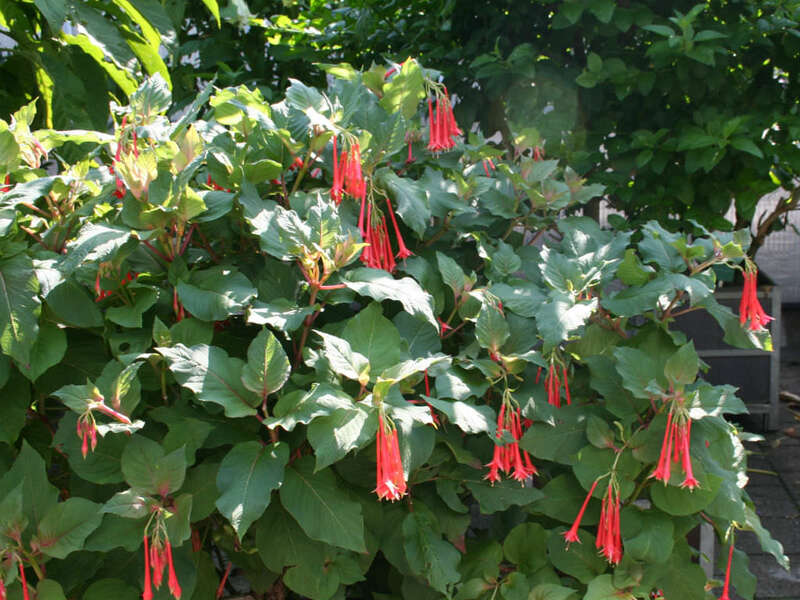 Add some controlled-release fertilizer pellets at repotting time to increase vigor… – See more at: How to Grow and Care for Fuchsia.